MRI after concussion is the most sensitive of the structural tests. MRI, as its name indicates, utilizes magnetic fields to image the brain’s tissue, as opposed to the X-ray radiation of the CT scan. The patient lies wholly within a magnetic tunnel, as opposed to the more open CT scan. This however can present a real problem with patients that are claustrophobic (afraid of enclosed and small spaces). If a person has just been in an accident they may be very agitated too and make the procedure/scan very difficult to get accurate results. MRI has better resolution than CT.
MRI is better for Parenchymal Lesions. MR has some value in post acute evaluations. MRI has no ionizing radiation, ala, CT and X-ray. MRI sagital images (side view) have superior resolution to CT. If it is at all possible to do an MRI after concussion on an accident victim it will be more forthcoming in results than a CT. If deciding which one to do, the MRI is always the right chose if possible. MRI is a structural test. MRI can’t be used if patient has IV lines and ventilation equipment or pacemakers, because of its magnetic field. Patients find MRI more difficult to tolerate as the test is conducted in a much more confined space and takes substantially longer to complete. MRI has a longer scanning time. Make sure that the facility has: A 1.5 Tesla Strength magnet in the MRI it is using, and uses a technique for seeing petechial hemorrhages, called Gradient Echo Imaging. Consider medication with claustrophobic patients. 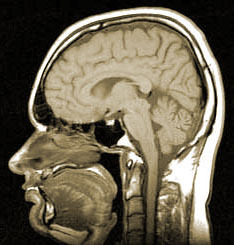 No Open MRI – Resolution is insufficient to identify brain injury. Magnetic Resonance Angiogram – MRA can be an extremely useful diagnostic tool if blood flow issues are involved.